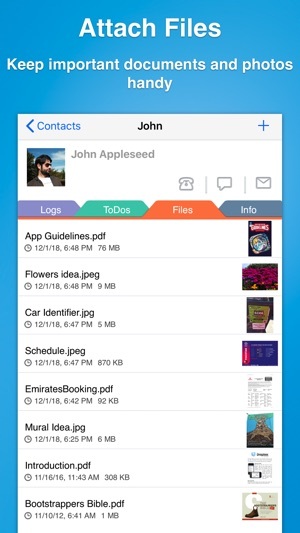 Contacts Journal CRM is a powerful, easy-to-use tool that will transform how you manage your business and professional relationships: save notes of important meetings, set follow-ups, create custom fields, attach important documents to your contacts, and much more. If you are someone who interacts with many people, professionally or personally, Contacts Journal will help keep you on top of everything. Don’t keep it all in your head, or locked up in a spreadsheet – use Contacts Journal to track your interactions with the people who matter. 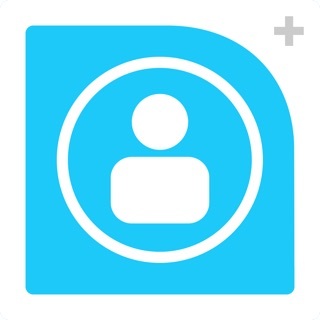 • share data and collaborate on your CRM with colleagues with Contacts Journal For Teams! • professionals like lawyers, real-estate agents, teachers, nurses etc. Use our powerful “Create Contacts” page to quickly and efficiently add new contacts, and setup various triggers, all on the same page. 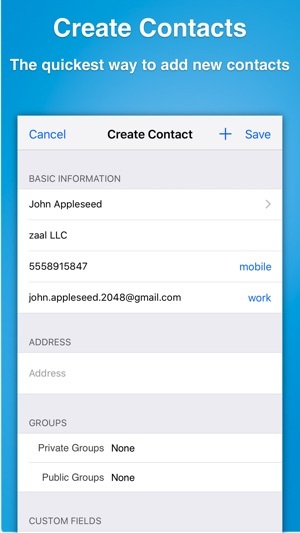 Create Private Contacts to keep information separate from your Contacts app. 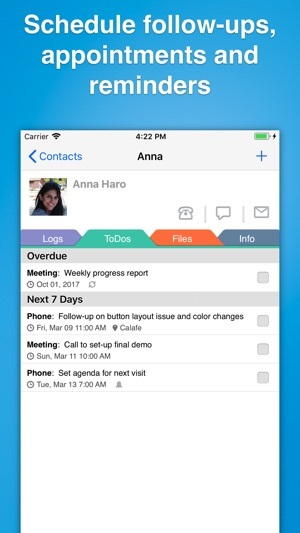 Keep track of important activities for each contact: keep notes for each meeting with Logs; create follow-ups and reminders with ToDos; attach images and documents with Files. Your contacts’ addresses are automatically geo-coded and placed on the Map view. You can also color-code the pins for each contact. 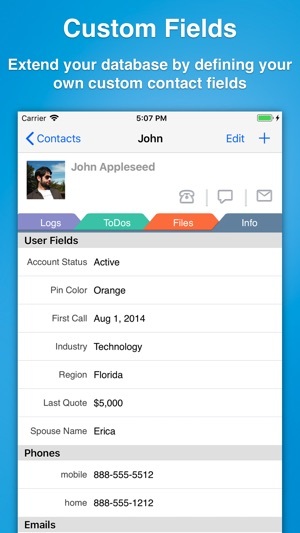 Extend the app by defining and creating your own custom fields, and attaching custom data for each contact. For e.g. you can create fields like “Account Number” or “Account Status”. 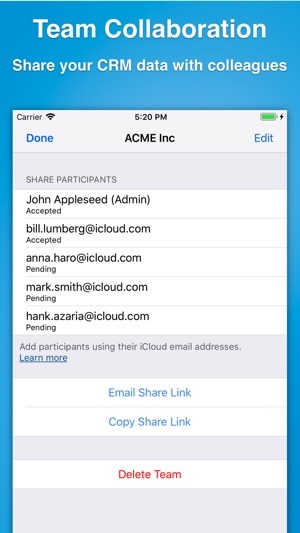 Enable the CloudSync option for automatic, seamless syncing between the Contacts Journal app on iOS and Mac, using your iCloud account. Works great when offline as well! No account signup needed! Your data is always under your own control, and we don't have any access to it. • The Unlimited Plan is a one-time purchase, and can be restored on other iOS devices. 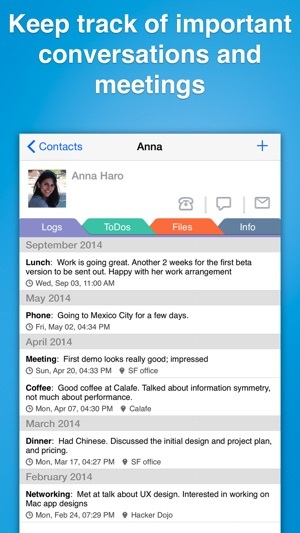 Contacts Journal For Teams requires a monthly or annual subscription that is purchased through the app. Only the person creating a team needs to purchase a subscription; team participants can join a team for free. Contacts Journal CRM subscriptions will automatically renew unless canceled within 24 hours before the end of the current period. Payment will be charged to iTunes Account at confirmation of purchase. Subscriptions may be managed by the user and auto-renewal may be turned off by going to the user’s iTunes Account Settings after purchase. Any unused portion of a free trial will be forfeited if you purchase a subscription. - iOS10 is no longer supported. Please update to iOS11 or iOS12 to receive further updates to Contacts Journal. - New setting for the Default Tab to open for each contact. If you always want to open the Info tab when you select a contact, you can now do that! 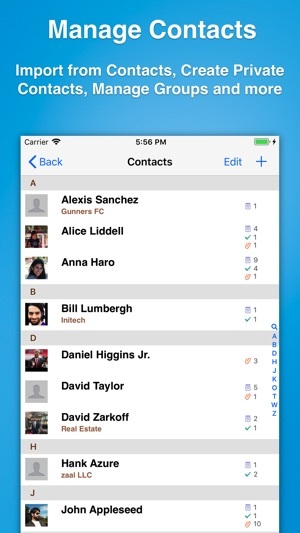 - The 'New Contacts Detected' alert now has a "Quick Import" button, so you can import the new contacts with one button. • setup custom User Fields data ... if you have Favorite fields, the default values are already filled in! If you enjoy the updates, please support us by leaving a review in the App Store (or updating your existing review), and recommending us to your friends and colleagues. Each review and referral matters, and helps us grow and improve our app. If you run into any issues or have any questions, please email us at support@zaal-llc.com. 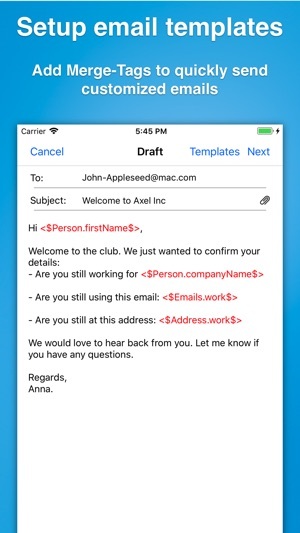 I’ve tried several personal and business CRM apps and this one is the most simple to use. I really like the export feature so I can see all my logs for each person on one sheet. The map tab is really cool to see where contacts are, really nice when traveling and realizing there’s someone nearby you can meet for a quick meeting or meal. Also like that it syncs across my Mac, iPad and iPhone. My biggest problem is...It’s so ugly! You’re unable to change font color, sizes, type face, etc. From what I’ve read in the reviews, the app has looked the same for years. Exporting creates a PDF that I think is Times New Roman. Bleh! The most annoying part is the profile fields on the Mac version only shows one line so if I type something long, I can only view it on my iPhone. I also stopped using the To Do list because when I linked it to my calendar, the only option for time is a start and end date, no all day feature. Now I use Fantastical for tasks. The app also duplicates my contacts. Some kind of glitch from the Apple Contacts. Apparently, Apple combines Google and iCloud profiles for convenience. But this app creates two profiles. So I had to go through and unlink Google, delete the profile in Contacts, then go back and delete the duplicate from the app. Overall, good app that I’ll use until I find something better. Thanks for the feedback. FYI, we updated the Mac app a few days ago to support editing and displaying Fields data over multiple lines, so that should resolve your highest-priority feedback. We'll also be working on a visual refresh this year. Also, if you need help with duplicates, let us know over email, through the "Report a Problem" option. Hope this helps, and maybe you can update your review and rating! Oh My Gosh!! The New 2019 Update!!! Fantastic Upgrade! Lots more flexibility, lots more color, and it crosses over to my iPad and Mac, effortlessly! Thank you for listening, and constantly improving this app. I’ve used for many years. Make sure you sign up for the unlimited version! 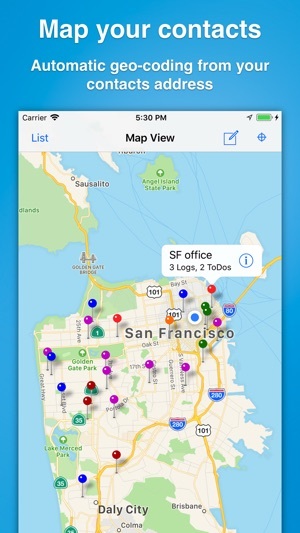 You WILL use this app, as information flows seamlessly from and to Apple’s Contact List. Great use of color now, in tabs and pins. Would be nice to allow us to name what the pins color represents, like a key chart. Overall, one of the most used apps in my devices! And the New Quick Add secondary app also works seamlessly, to either add a customer or prospect quickly, or to look up one fast!! Thank you for sticking with this - It has become my life-blood for my sales business! UPDATE: This is still the best app of its kind available. I’ve been using it daily since 2009. Just a suggestion for a future update: Include the ability to crop a photo taken in the app and/or include a setting for document photos that will automatically crop. Indispensable! I've been using the app daily since 2009. It keeps getting better with every update. Excellent communication from developer. I highly recommend this app and the developer. It would be helpful for users to be able to add a file by taking a photo from within the app vs. having to add the photo from the camera roll. As it is now, going back and forth into camera roll to add multiple photos is time consuming and frustrating. An even better feature addition would be to also have editing capabilities such as cropping and photo enhancements. These options are available in other popular iPhone apps, so hopefully we will see this in the next update. UPDATE: Wrote to the developer about taking in-app photos and within hours received a detailed response. I was happy to hear that there are plans to add this feature.